The Rise and Fall of the Trigan Empire was especially made for the magazine Ranger, of which the first issue appeared in 1965. 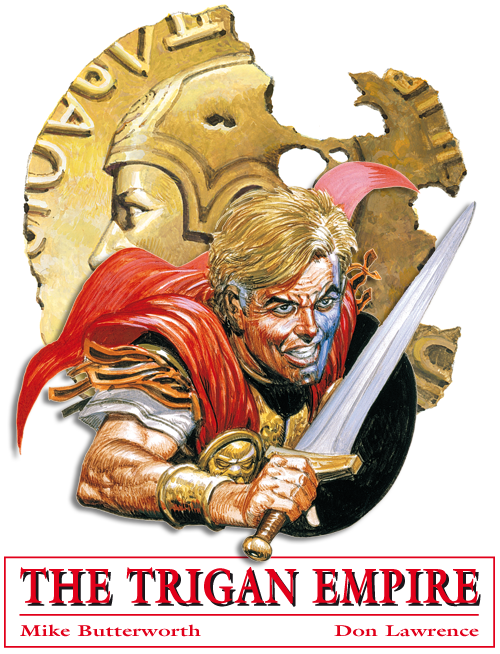 Publishers house Fleetway wanted to publish a new magazine in which The Trigan Empire would be the leading comic. After Mike Butterworth was contracted for the scripts, the editors went looking for the right illustrator and found… Don Lawrence. The stories about the Trigan Empire were full of action and beautiful artwork, painted in the tradition of Frank Hampson and Frank Bellamy. Don Lawrence: “They thought of this idea that it would be cheaper to reproduce the work if it was done in inks. And, so all the artists had to use inks. And it’s extremely difficult to use inks, because they have qualities which are very difficult to manipulate. There not easy, like gouache or watercolour. And it just meant learning a new technique. But, when the boss says you do that, you do that. It got that nice quality. But there are certain colours that couldn’t mix. If you put yellow on, then you tried another colour on top, it would form a sort of greasy bubbles. And however you spread it, it would go back into bubbles again. After eight years they relaxed this and they said you can use whatever you like. Well they didn’t actually say that, it’s just you did other things and they didn’t say no, that won’t do. Don Lawrence drew the Tales of the Trigan Empire from 1965 till 1976. After a disagreement with his publisher about the price for the artwork and royalties Don quitted and started working on another hit series Storm. Mike Butterworth wrote the tales of the empire till the comic was cancelled in 1982. The artwork was drawn by Oliver Frey and Gerry Wood. After the Trigan Empire, Mike Butterworth continued writing on his successful thrillers like The Five Million Dollar Prince.